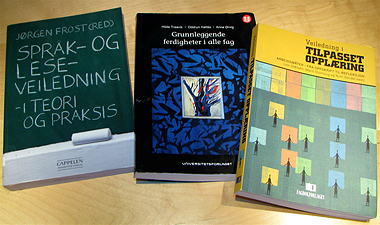 Over the last one and a half years three textbooks have been published in Norway containing articles about Storyline. The articles relate Storyline to reading and writing as basic skills and Storyline as a method for differentiated learning. The book “Språk- og leseveiledning – i teori og praksis / Language- And Reading Guidance – In Theory and Practice” give insight about theory, scientific research and experiences in the field of reading and language guidance. Readers will find many useful ideas and lesson plans designed to improve the reading skills. Cecilie Falkenberg from University College UCC in Copenhagen has written one article about how storyline can a great help when the pupils are acquiring the written language. The article is called “Adventure and involvement in reading education through the storyline method” and in it Falkenberg displays the many possibilities the storyline topic “Forest of the Trolls” gives for varied and systematic language training. In this book, “Veiledning i tilpasset opplæring / A guide to differentiated learning” published by Fagbokforlaget, Marit Storhaug at the Teachers College in Oslo has written a lengthy article about how Storyline can be an effective tool to differentiation in the classroom. She elaborates on this by showing how differentiation is expressed in three different Storyline topics; the Multicultural Street (3rd grade), Parvana – a book based Storyline (7th grade) and Factory town 1850 – the early industrialisation in Norway (8th grade). According to the Norwegian curriculum there are five basic and obligatory skills in all subjects; reading, writing, oral, math and digital competence. In the book “Grunnleggende ferdigheter i alle fag / Basic skills in all subjects” the authors give examples of how these five skills can be trained in different subjects. Barbara Blair and Hege Emma Rimmereide from the Teachers’ College in Bergen has written an article about “The web competencies in English” in English. In the article Blair and Rimmereide present “The Detective Agency”-Storyline intended for implementation at lower secondary school, years 8-10. This Storyline is inspired by Roger Fisher´s “Detective Agency”, Storyline Design, USA, and all the basic five skills are included in a number of activites.